The Iraqi army has begun its fight to retake control of Mosul from the so-called Islamic State (IS), but thousands of civilians remain trapped in the city. The city's residents have experienced brutality under IS but they may face even greater danger in the coming weeks. The city is virtually sealed off and reports suggest IS is killing civilians who try to flee and using others as human shields. IS reportedly hung 20 heads at Mosul's city gate as "blood propaganda" - a warning for soldiers or citizens not to enter or leave the city. Other reports said IS fighters conducted house-to-house raids to confiscate mobile phones and record internet usage, making any communication with people outside the city extremely dangerous. The BBC cannot independently verify the accounts but stories from Iraqis who have escaped the area corroborate reports of the risks involved in trying to flee. Some of these accounts were provided to the BBC by the al-Ghad radio station, based in Erbil, Iraq, which encouraged listeners to call in with their experiences. Omar, 50, said IS had threatened to shoot people who tried to leave. He managed to escape his village early one morning but his family almost died along the way, he said. "It was extremely hot and we were dying of thirst, the sand was up to our ankles," he told Oxfam. "We finished our water just a quarter of the way into the journey and my wife and children couldn't go on anymore. "I walked [ahead] by myself to fetch them water and carry it back to them. It took me seven hours. There were children dying on that journey. There were snipers shooting at our heads." 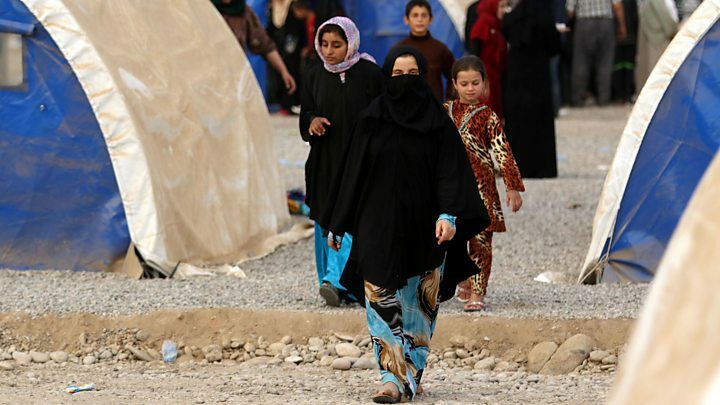 Mohammed said that the number of IS militants in Mosul is falling as fighters leave the city with their families. He said he expected Mosul to be "liberated with minimal fighting". "I went around the city and I want to tell you their numbers have been massively reduced," he said. Mohammed said that while a number of vehicles left Mosul, some cars and caravans in the city had been "filled with explosives". Sarah, a resident of Mosul, said that while many people were "excited" about the Iraqi army's mission to regain control of the city, locals were also fearful of being caught in the conflict. "I want to tell them that we have been waiting for you for over two years now, and we are hopeful you can liberate us," she said. "But please take care of the innocent civilians inside Mosul." Arash, an Iraqi whose family lives in Mosul, said that when he contacts them, they are often afraid. "We can only talk for a few minutes," he said. Arash said that civilians in Mosul began to rebel against IS when they heard that pro-government forces were advancing toward the city. "They started this uprising," he said, adding: "They started burning IS cars and trying to kill as many family members of IS as possible. "They try to use the instruments they have to take down IS. No one has a gun, so they have made homemade bombs with fuel and glass." Ibrahim said two of his daughters had died while trying to escape from their home town of Qayyarah, south of Mosul. One girl stepped on an explosive device and was instantly killed, and the other later died as he tried to carry her to safety, he told the Norwegian Refugee Council. Two of Ibrahim's four daughters are still alive and one is captive in Mosul. He hopes the battle to recapture the city will help reunite his family. "At least then I can get back one of my daughters," he said. Mohamad runs a radio station in Mosul. He said that when IS arrived, the city became isolated and the station became a mouthpiece for people in the community. "I think we have become the platform that helps people talk to each other," he said. His station's first broadcast was in March 2015. "It was a big victory for us and was also appreciated by the people inside Mosul," he said. "We are updating them on what is happening and not only this, we are being their voice." Mohamad said that conditions in Mosul were "very hard". "Now it has become harder to get anything from outside the city. The only available food is what you can grow inside Mosul. Now medicine is very expensive, it's very hard to get it for the family." Ahmed, another Mosul resident, spoke to the al-Ghad radio station based in Erbil, Iraq. Al-Ghad provided recordings to the BBC. Ahmed said IS fighters were fleeing Mosul. "The number of Daesh (IS) people on the streets inside city has reduced significantly," he said. "Some have left for Syria, and some have gone into the desert, west of Mosul. "The number of their cars driving around the city has reduced, and we're seeing more of them using motorbikes at the moment instead of their regular cars." Hassan, 28, said he saw his friend killed by IS militants. "IS killed two of my best friends in the most horrible way because they tried to escape to territory held by the Iraqi security forces," he told the International Organization for Migration. "[They] hit their heads against the roof of the car until they didn't resist anymore, and then lined them up and shot them." Hassan said fighters had used him as a shield to play sport. "IS would force us to go play football with them, because they knew that when they were among civilians the planes would not target them. So they would force us to go different places with them."